CBD American Shaman’s Clearomizer is preloaded and ready to add to your battery and vape. 100% Natural-Pure CO2 Extract. Itʼs 100% Organic, Gluten Free, Non GMO Hemp and has No Heavy Metals or Insecticides. Batch tested to ensure potency. 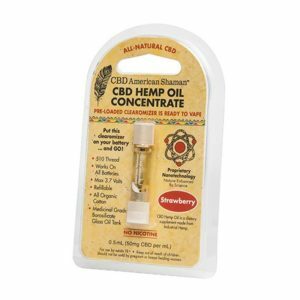 50mg CBD per mL. 10 delicious flavors: Blueberry Moon, Cherry Limeade, Cool Berry, Grape, Natural, Pina Colada, Strawberry, Strawberry Banana, Tropical Punch, and Watermelon.